As a decidedly unconservative dresser, it thus becomes very meaningful when the typically bold-suited Nucky Thompson dons traditional morning dress for a morning in church. After all, this is a man far more comfortable in a smoky, champagne-soaked nightclub behind the bold distractions of a pastel-checked suit. The dramatic second season ended with Margaret Schroeder saving Nucky from the clutches of the law by marrying him… and immediately regretting it upon deducing Nucky’s role in the death of his former protegé Jimmy Darmody. To punish her newlywed husband, Margaret deeds Nucky’s land to Saint Finbar’s Church. 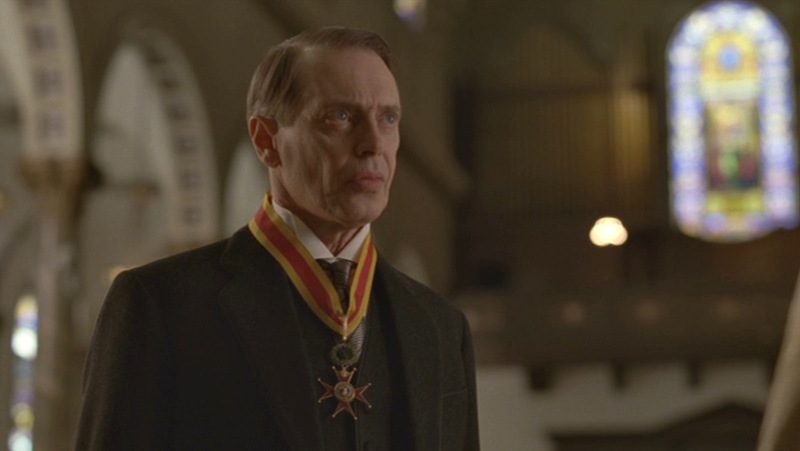 The third season begins a year and a half later as Nucky is made Knight Commander of the Order of St. Gregory the Great by Pope Pius XI and is invited to accept his commendation at Saint Finbar’s. 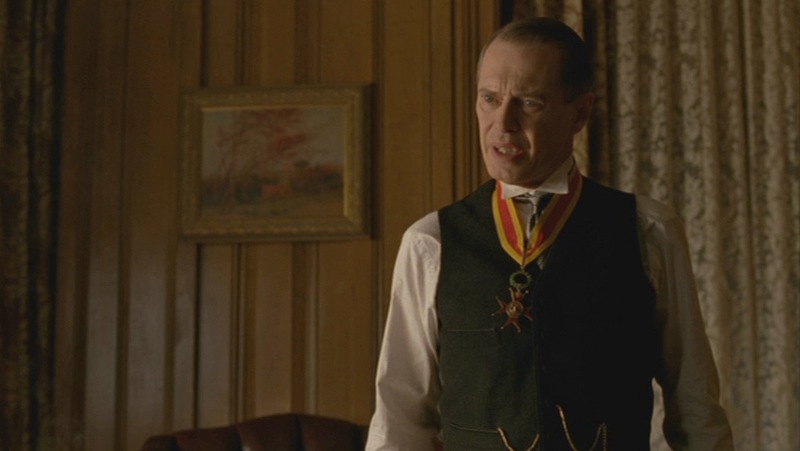 The episode of Nucky’s acceptance addresses the murkily ungrateful world that women faced in the early 1920s, as Margaret is forced to stand by her murderous husband as he receives an award for her good deed. A nosy neighbor jokes to Margaret that Nucky’s new knighthood means that his armor will need to be polished. The empowered Margaret uses the knighthood reception to seek an audience with the bishop to open a women’s health clinic in the Catholic-run hospital despite the bishop’s spineless objection that “there are some delicate topics which would have to be avoided.” Nevertheless, Margaret persists. 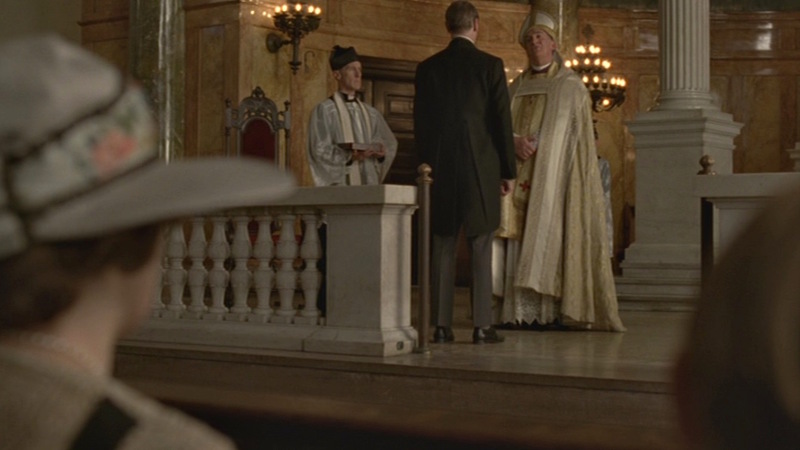 Receiving his award from the church is the perfect occasion for Nucky to dust off his morning dress in “Bone for Tuna” (Episode 3.03). Nucky: You have no idea how uncomfortable this is. Margaret: You’ve made your discontent abundantly clear. Nucky: I meant the suit. It shrunk or something. 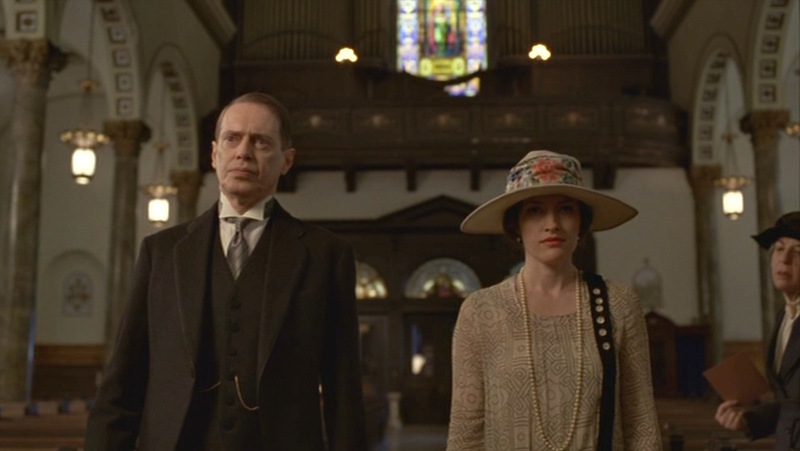 Nucky: Do you know the last time I was even in a church? On our wedding day. Nucky: Tired. Barely slept again. Margaret: Well, what do they say on Broadway? The show must go on. Nucky’s morning coat is a heavy black wool tailcoat with the elegant touch of 1/4″ black silk ribbon braiding piped along the edges, including the softly notched lapels and the welted breast pocket. The breast pocket is typically the only external pocket on a morning coat, giving gentlemen a place for their pocket squares without disrupting the coat’s fitted silhouette with additional pockets (and their bulging contents!) Nucky commits the faux pas of neglecting to fold a pocket square into his breast pocket… perhaps he forgot standard conventions in the years since he had last worn it. The day is permeated by bitterness from all parties. Morning Dress Guide, the definitive online source for daytime dress, offers a comprehensive history of morning dress and detailed descriptions of every element to offer readers a guiding hand for perfectly executing morning dress. I would recommend reading that for the ultimate expertise when exploring morning dress. Morning coats widely varied in terms of details and styling, particularly at the height of their popularity in the early decades of the 20th century, but a feature present on nearly all morning coats are the distinctive open cutaway shape of the front skirt. 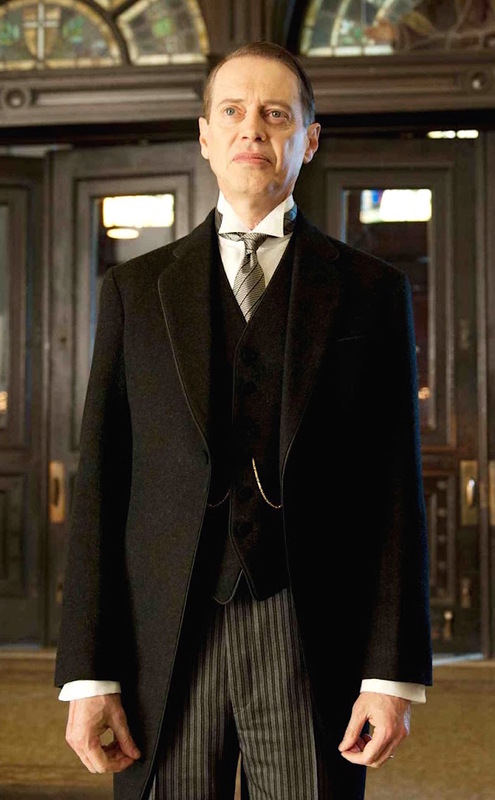 Nucky’s coat, on the other hand, has straight front quarters that only cut away toward the back at the very bottom. The height of morning coat popularity in the 1900s and 1910s also meant a variety of different styles with button options ranging from the standard one to up to four and a mix of peak, notch, and even shawl lapels. The decline of morning dress in the mid-1930s led to the current standardization of the morning coat to reflect only the most formal details: peak lapels and a single-button closure. “The morning coat, still a semi-formal garment, was often cut with notched lapels until the 1920s,” explains Morning Dress Guide. “In the early 1900s to the 1920s, morning coat buttons were usually covered in intricately patterned damask silk. With a damask weave, the pattern is created by weaving the warp and weft in a special way rather than printing the pattern on the silk.” Nucky’s jacket appears to have this same damask silk-covered single button closure. Nucky finds himself quite literally “sweating like a sinner in church,” as the expression goes. The four-button cuffs are likely also covered in the same damask woven silk as are the two decorative back buttons that preside over the pleated back tails, located where the horizontal dart and the two side darts meet. Contrasting waistcoats, particularly in dove gray or off-white “buff”, are a popular option for morning dress, but the most classic and formal option is to match the waistcoat to the morning coat. Nucky ups his outfit’s formality quotient by sporting a waistcoat made from the same heavy black wool as his coat. The waistcoat reflects the styling of the morning coat with the same decorative black silk ribbon braiding along the edges and on each of the vest’s four welted pockets, six buttons all covered in the same damask woven silk, and the soft corners of the gently notched bottom. Nucky holds court at his Ritz suite after the ceremony. 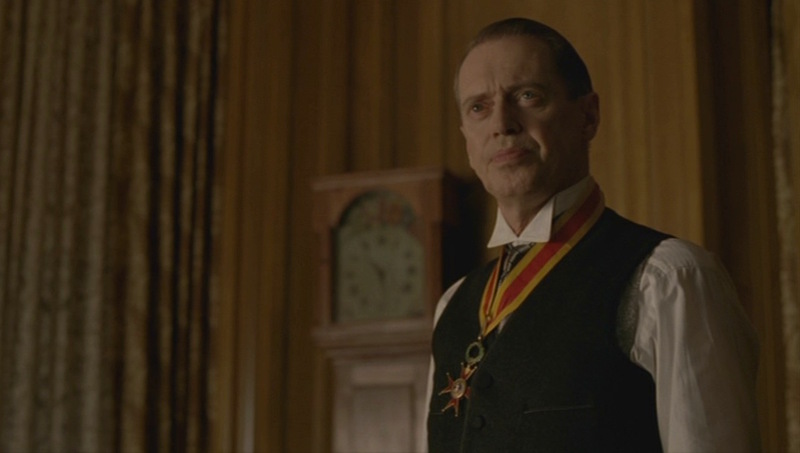 Nucky wears his gold pocket watch in the lower right pocket of his waistcoat, connected by a yellow gold bar-link chain worn “double Albert” style through the fourth buttonhole to a dropped fob on the left side. Nucky casually refers to his outfit as a “suit” when complaining to Margaret, but his contrasting trousers more correctly define his attire as “morning dress” than the matching three-piece morning suit. His black-on-gray cashmere stripe trousers in worsted wool are perfectly on point for morning dress. 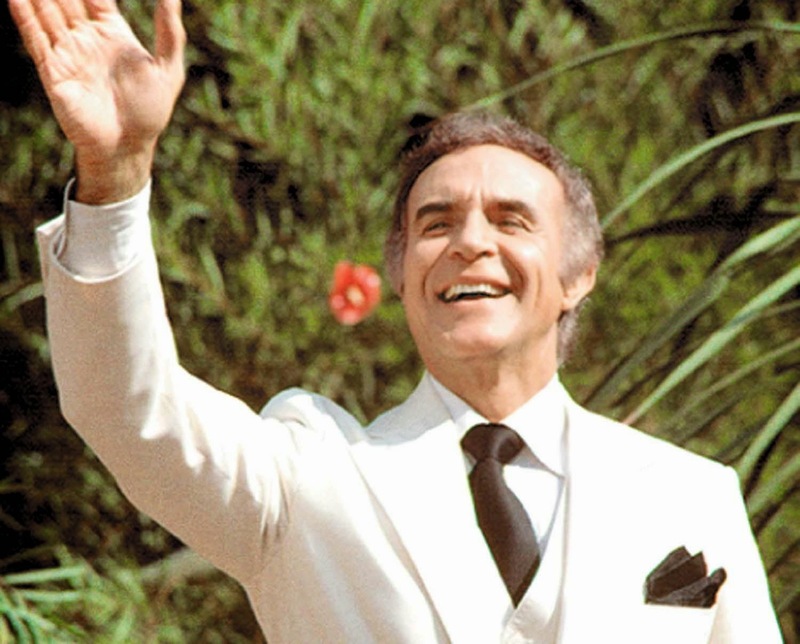 The double reverse-pleated trousers rise high with the waist line properly concealed under the waistcoat. 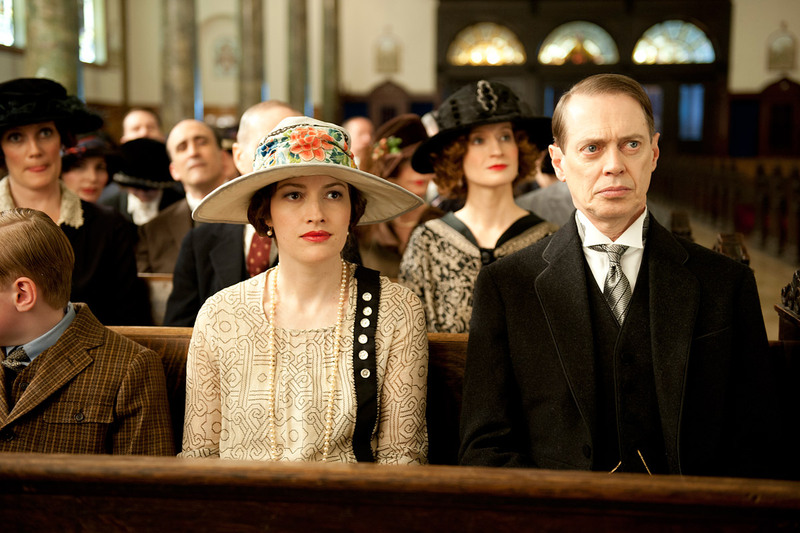 Nucky tries to make nice in church. 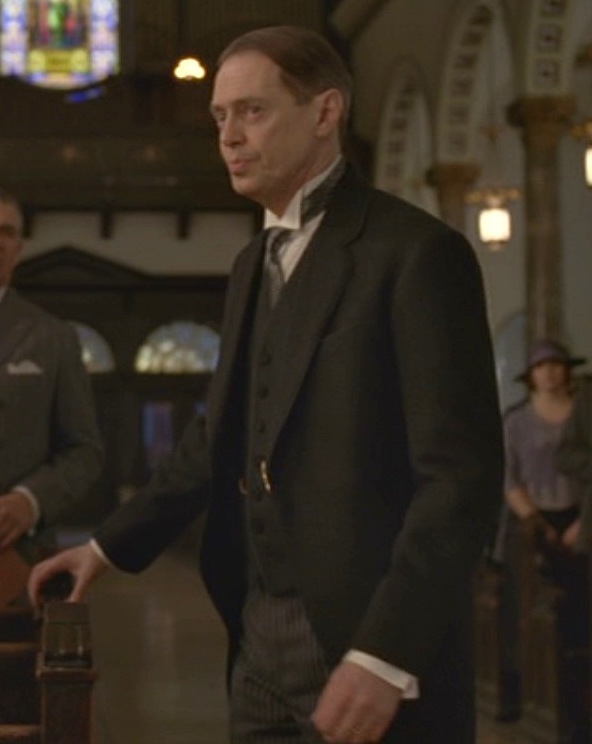 Nucky correctly wears his trousers with suspenders, in this instance a pair of wide light gray paisley-patterned braces that peek out through the armholes of his waistcoat after he removes his jacket. Nucky wears a white twill dress shirt with a detachable wing collar and double (French) cuffs fastened by dark enamel-filled round links. His neckwear is a gray striped silk tie that consists of light-and-gray horizontal stripes overlaid by thin dark navy stripes, each shadowed by a light gray stripe above it, crossing in the direction of the left shoulder down to the right hip. The combination of a wing collar and a long tie dates Nucky’s outfit, as the morning dress standard since World War II has been long ties and turndown collars or Ascots with wing collars. 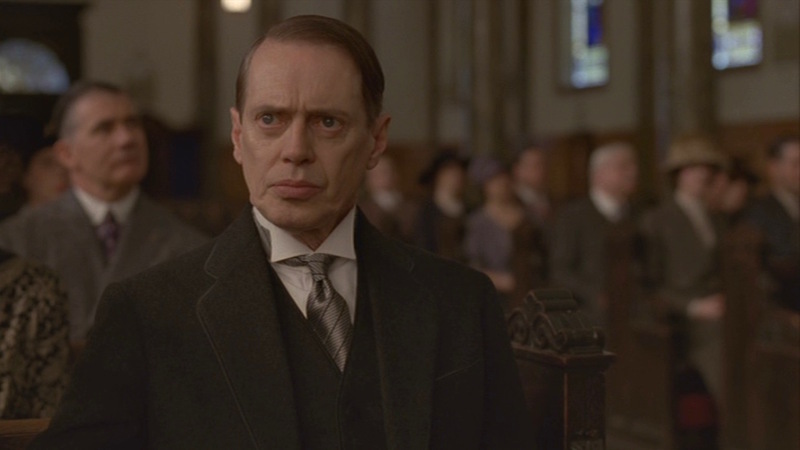 He looks reasonably concerned, but a guy like Nucky should be sweating a lot more inside a church. Nucky wisely wears black leather oxfords, likely with the traditionally preferred cap-toe, as the ecclesiastical ceremony would call for the most formal footwear. He wears them with gray silk socks visible below the short break of the trousers’ plain-hemmed bottoms. Nucky steps up to the altar to receive his Order of Knighthood. Not that he necessarily deserves it, but Nucky is awarded his vestment as a Knight Commander of the Order of St. Gregory, an eight-pointed cross with a representation of St. Gregory on the obverse and, presumably, the “Pro Deo et Principe” (“For God and Ruler”) motto on the reverse, suspended from a gold-red-gold striped ribbon around his neck. As a civilian recipient, Nucky’s cross hangs from a green crown of laurel; military recipients would wear the cross hanging from a trophy of arms. That’s Sir Nucky to you. The pontifical order of St. Gregory the great acknowledges not only the material generosity that our honoree exhibits daily, but his generosity of spirit as well… Enoch Malachi Thompson, for having answered the gospel summons to brotherly love and illustrating by your actions the ideals of the church, for having enriched the heritage of humanity and providing an example for others to serve, by order of Pope Pius XI, I now bestow upon you the title of Knight Commander of the Order of St. Gregory. The Order of St. Gregory the Great was established on September 1, 1831 by Pope Gregory XVI. Did You Know? Nucky shares his Order of St. Gregory the Great knighthood with G.K. Chesterton, Bob Hope, Rupert Murdoch, and Ricardo Montalbán. Nucky Thompson seems to take his reluctant knighthood seriously, dressing for the occasion in period-specific morning dress with subtle touches of elegance throughout. Check out the whole series, but Nucky’s shining moment featured in this post can be found in the third season. Whilst the costumes were generally excellent, Boardwalk Empire’s formal wear often wasn’t quite so assured. I’m not overly convinced by this morning coat. It looks almost like it might be cut like a lounge suit coat but longer and curving away (but as you say, only at the bottom). The result is that it hangs off Buschemi in a not wholly flattering way. A true morning coat is a body coat and should hug your body even if unbuttoned and vintage examples often have what is by today’s standards fairly extreme waist suppression- a far cry from this morning coat. Still, it is overall an elegant look and ideal for anyone looking to pick up honours, medals from their head of state or induction into any order of knighthood. Incidentally, anyone interested in morning coats should check out Andrews and Pygott guide as well – https://andrewsandpygott.wordpress.com. Unfortunately, it doesn’t seem to have been updated for years but is an entertaining guide to morning coats and black lounge. Thank you for the thoughtful feedback and the link to the Andrews and Pygott guide – a fun site as well as informative! Agreed with all points. I certainly wouldn’t use this as the standard when demonstrating morning dress, but it’s certainly congruous with Nucky’s own idiosyncratic sense of style: a happy medium of the show’s costume design and the character’s own eccentricities. Indeed, this garment seems to meet at the crossroads of morning and lounge. I’d love to get some insight from the show’s costume design team on this one.